Actually, we arrived in Paris by train the day before, but we only made it to the Eiffel Tower and I’m going to save those details for next week. So we’re moving on and I’m going to talk about our first full day in Paris. While we were planning our trip we were really excited about seeing castles. 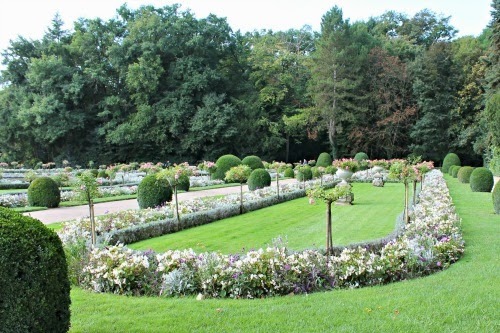 We planned to see Windsor Castle and Leeds Castle while in England (you can read about our trip to Windsor Castle here and Leeds Castle here), but we really wanted to see some castles while we were in France too. 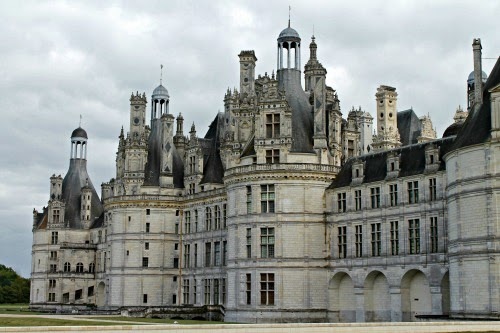 After some research we decided to take a tour to the Loire Valley, home to some of France’s most popular (and most beautiful) castles. 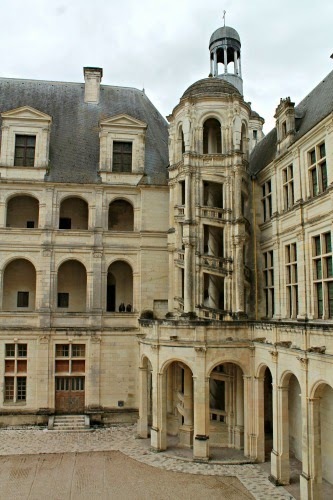 We ended up booking the Loire Valley Castle Tour with France Tourisme. I’m torn on my review of our tour because the castles were amazing, but the tour was dreadful. So I’m going to rant about the tour right now, so we can move on and talk about the castles for the rest of the post. Our guide was horrible and uninformative, especially compared to our tours in London. He gave us a VERY brief introduction to each castle before we arrive and that was it. Our guides in London talked about the towns we were driving through and pointed out interesting buildings and landmarks along the way. 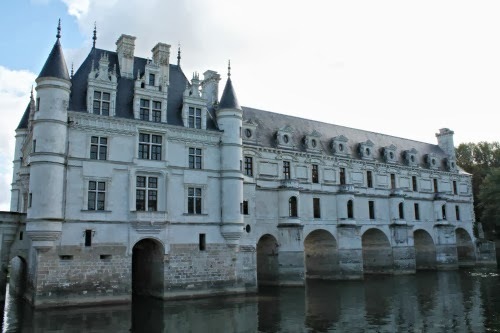 Plus it’s a long drive to the Loire Valley (3 hours), but you only get a short amount of time at the first two stops (they give you more time at the last castle). DO NOT BUY THE LUNCH OPTION! 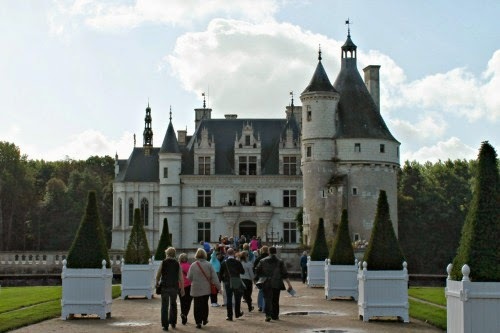 If you do, you’ll only get to spend about 30 minutes at Château de Chenonceau…and half of that time is spent walking to/from the castle. Seriously, we only had a few minutes to run through the ground floor of the castle and take a few pictures of the gardens before we had to meet for lunch. That being said, there’s no way we would have been able to get out there and see all three of the castles by ourselves, so we’ll call it a necessary evil and I’ll end my rant right here. 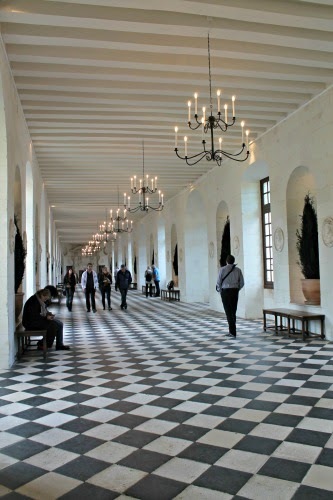 Our first stop was Château de Chenonceau, which is currently celebrating its 500th anniversary! 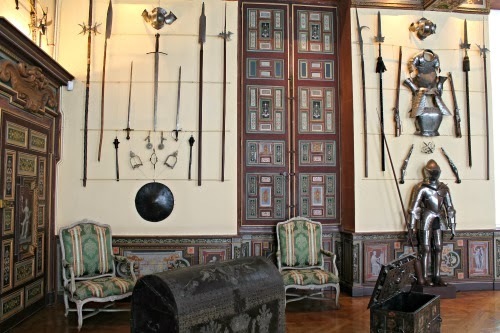 As I mentioned above, we only had time to explore a few rooms. 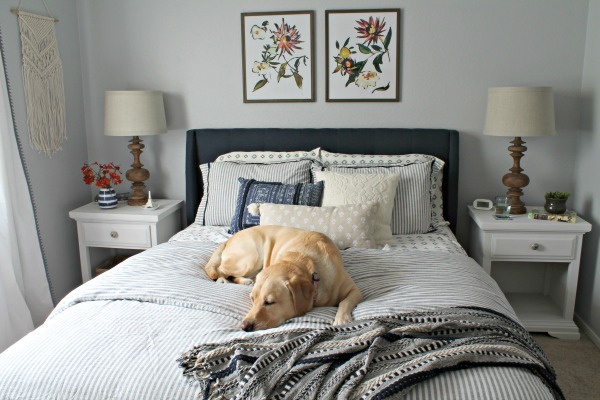 My favorite was the gallery – I love all of the natural light and the checkerboard floor. Once we finished up inside, I quickly made my way through one of the gardens to take a few pictures and see the castle sitting over the River Cher. The castle is pretty from the front, but the side view is amazing. Such a beautiful place! 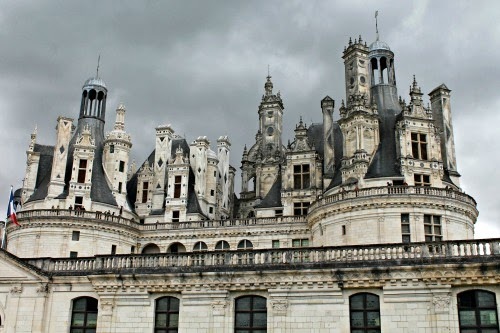 Our last stop was Château de Chambord – the largest and most badass castle of our trip. Seriously, THIS is a castle! We actually had a decent amount of time at this stop, so we had plenty of time to explore the castle. 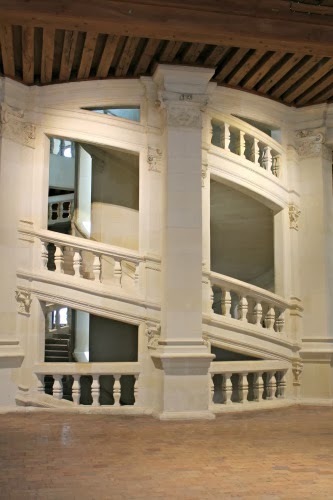 Inside the castle there’s an amazing double-spiral staircase, which is believed to be inspired by Leonard da Vinci. 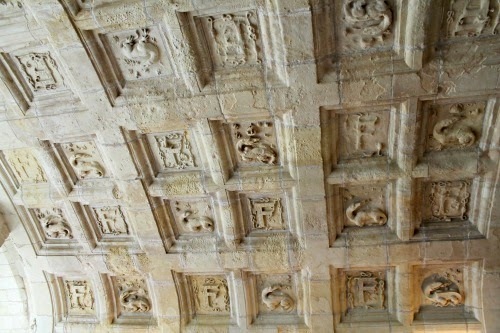 The castle also has gorgeous coffered ceilings. The F is for King Francis I and the salamander was his personal emblem. Once we finished exploring the inside we headed back to the bus and back to Paris. It was a long day, but we loved all three of the castles. They were definitely worth the long bus ride and tour problems. All I can say is WOW and glad you took these fabulous pics to share with us Sam! What a lovely castle tour! Each one is just amazing. The spiral staircase is really cool! Wonderful photos, thanks for sharing your visit. Have a happy weekend! Your pictures reminded such nice childhood memories, thanks! 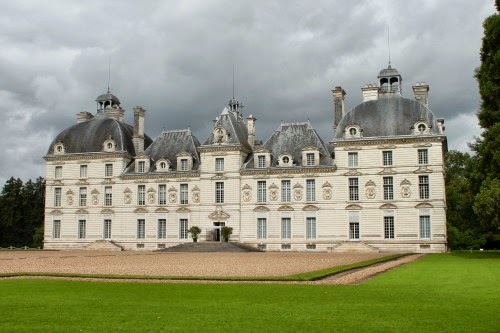 thank you for the chateau tour. I brought back memories of our trip in 2005. We fortunately had our own French friend guide. 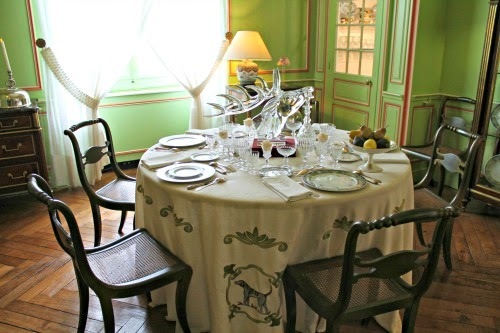 My favourite was Chenonceau. 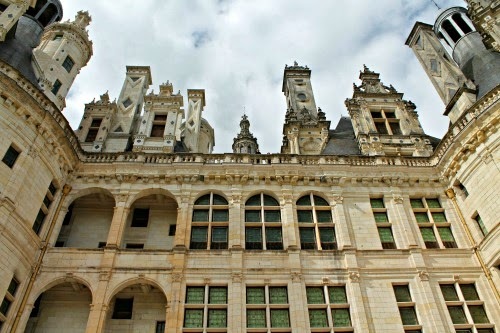 Chambord was closed at the time because it was a stop on one of the Tour de France legs. Have a wonderful weekend and Christmas. I am joining you through "oh the places I've been"
Oh, I want to go back! We were in London and Paris this summer but had no time for exploring castles. These look magnificent. 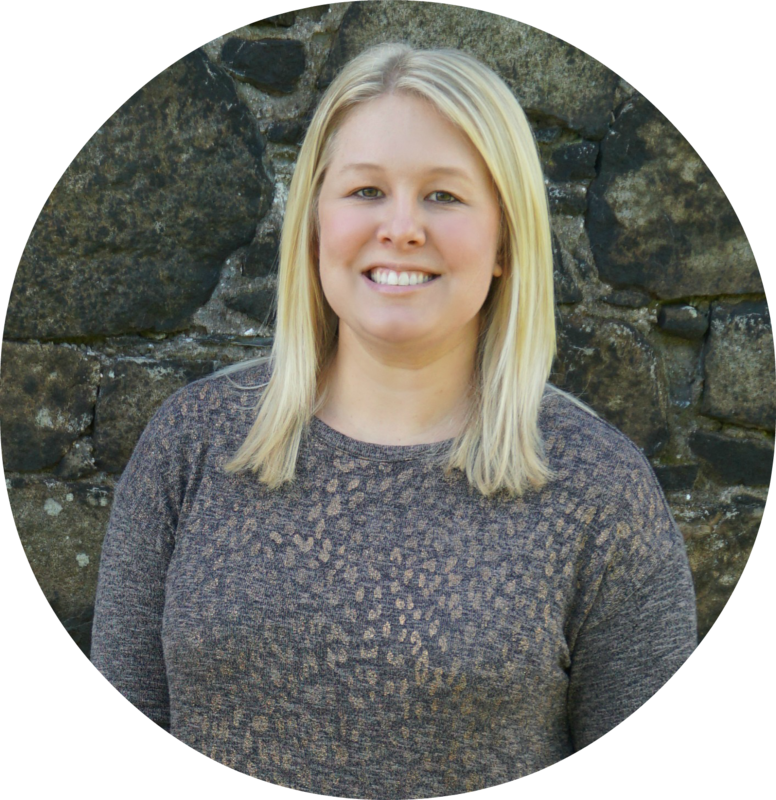 Great to have you at "Oh, the PLACES I've been!"